In centuries past, children were to be seen and not heard, but in our time children are often the focus of our parenting world. Children’s welfare is a high priority, but in the western child’s hectic schedule, there is rarely time to sit, reflect or feel, let alone grieve. 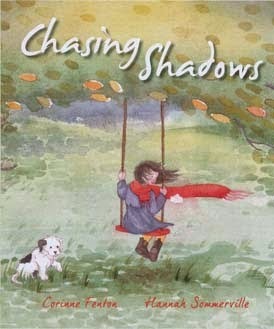 Chasing Shadows, with its sparse wording, epitomises the grieving child’s experience of being disjointed, disconnected and fearful of further loss. It is always difficult to watch a child lost in sadness, but when is the right time to fill that void with a new love? When is it time to chase the shadows away? Chasing Shadows takes a serious look at childhood grief, how well-meaning adults might try to make things better and the sheer unbounded joy of a young pet. While shadows of grief can trap a child’s heart, the real world still beckons, inviting courage and adventure to those who dare. Hannah Somerville takes up the rhythm and beat of Corrinne Fenton’s minimalist text, adding a puppy’s joy to the shadow-lines of the grieving household. Together, Corrinne and Hannah weave a gentle tale of grief and recovery, thus filling a gap in the contemporary storytelling market. There are teachers' notes available here.